I'm Dene Carter - I was one of the creators of Fable, one of the core team on Dungeon Keeper and the guy who made Incoboto for iOS. What do you want? I'm busy! I've been working on this weird little 'haunted arcade game' for about a month now. It's inspired by really beautiful old arcade machines of the 1980s - specifically Eugene Jarvis' Defender/Robotron as well as Berzerk. Spellrazor is an arcade game with (believe it or not) 27 unique fire buttons and a single directional stick used to guide the 'Adventurer'. Peculiarly, there is no aiming. Aiming is automatic, meaning that positioning and choice of spells are critical. What? 27 fire buttons? You're crazy. Or stupid. Or crazy stupid. That's a thing now, you know. Well, there's a weird story that half explains why this came to be, and why I call this a 'haunted arcade game'. The story goes that a guy named Duncan Bower created the original Spellrazor in 1980/1981 just before being booted out of Williams. He took the original code with him, and shortly afterward found himself working on, believe it or not, Polybius for the CIA/Sinneslochen, after which he disappeared. There are indications that even before he left he was edging toward insanity. Spellrazor is what he was working on before Polybius. Before he went mad. Hence 27 fire buttons and no aiming. You said something about a debug console? Is this thing broken? As in the original game, there's a debug console which the player can use to access various things. It's kind of glitchy, and infused with Duncan's odd sense of humour. 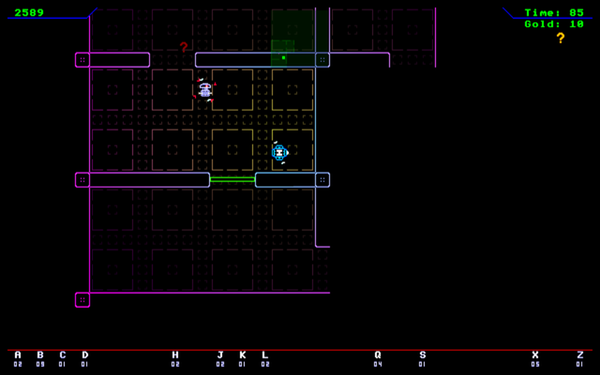 For example, there's a weird mode that slows down time when you don't move, which turns the game into a strategy game! There are numerous weird glitches in the game that seem to hint at something creepy within the game, buried deep within the arcane console commands. Am I going to enjoy it? I won't lie - it's a difficult game. And you only get one life. Add to that the secrets that are growing, plus the increasing levels of intelligence the monsters are beginning to show and it's clear that Spellrazor is not going to be for everyone. Games of this era were brutally hard, and - from the Williams stable at least - kind of sinister (as befits a guy who went on to work on Polybius). If you liked Defender or Robotron, you'll probably find this to your taste. This project is mostly done: there are a few more of the spells to put in, and a couple more enemies including bosses armed with the same spells as you, but it's already enormously (if masochistic) fun. The music's not final, but overall, I'm really pleased with how this little 'resurrection' has worked out. As the title suggests, it's not finished yet, but I'm happy with the overall feel. A new build is up today. 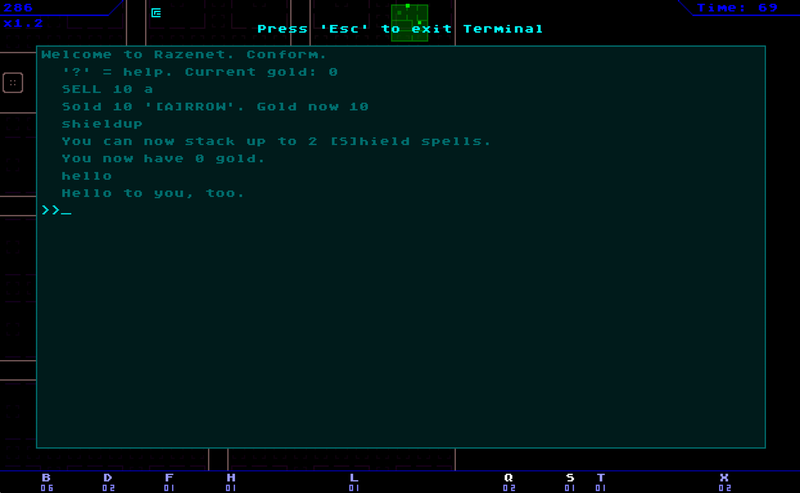 I got the player-accessible 'debug terminal' in and working. It's going to be an integral part of the game - considering the game's heritage. There's a host of hidden commands in there for players to find through playing the game. This week has mostly been about refining the player experience and improving the AI. 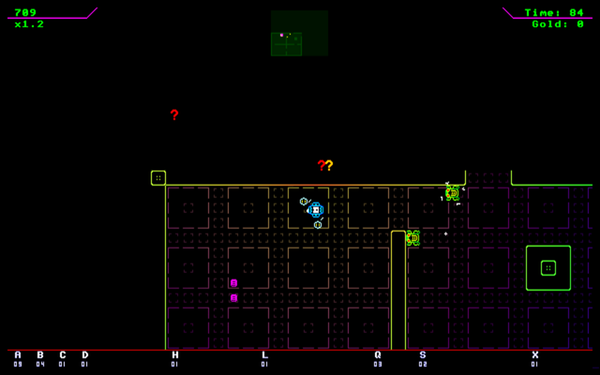 There are now AI behaviours based on tracking the player mercilessly, lurking in room-corners waiting to do nasty things, and hopping about from 'large-tile-center' to another. - Add the final 'Amulet of Yendor' McGuffin 'goal' - currently the final level's stats (level 20, I think) are regenerated so the game is currently an infinite-high-score game. Most notable is a buyable Slowmo mode that slows the game to 1% of its normal speed while you're not moving. This makes a profound difference in how tactical the game feels. It is, of course, entirely optional - you don't have to buy it, but it changes the game from 'PANICPANICPANIC' to something more thoughtful... if you want it that way. The new build is there at the top of the thread on page 1. Getting close enough to a Frog to do a sword-swipe. Two companions with me. Two frogs waiting around a corner to ambush me. Swordsman robot rushing in to attack. I have no companions, so they'll slice through my one level of shield like nothing. And another fine death at the hands of the super-fast Fly robots. Very cool. A bit disappointed to read that Bemuse is on hold for the moment (that aesthetic was so good), but glad to see you're still working on games. Will be downloading the current build over the weekend! Hey, thanks for that. I update it super-regularly, so it's always worth waiting until you're actually going to play it! As for BeMuse - me too. It's heartbreaking to do so much work and find that major parts just aren't clicking. The biggest issue was that the aesthetic and the gameplay didn't gel. I can lob you a link to the non-graphical prototype if you want? It's pretty brutal. 'Slowmo' mode is standard (turn it off in the console if you don't like it, using 'slowmo' as the command. Is there a way to make the game full-screen? Yup. Press 'tab'. Should be instructions on the main title screen? If not, something has gone awry. I see it now. Didn't wait long enough on the menu screen. Game is pretty cool. It's a lot of fun to test out the different weapons and abilities, and learning what each letter does. Thanks! How do you find the auto-slowmo thing? Have you used the console yet? Feel free to email me @ fluttermind, or pm me here if you don't want to spam/bump the thread. So what are your plans for this? A freeware game or full-fledged release on itch.io or Humble/Steam, etc.? Well, this version is going to remain freeware - to the point that I'm even giving away the source code and assets, believe it or not. Yup - my crappy code is there for all to see, like removing my pants in public. It's bracing... and kind of harrowing at the same time... but less 'ending up on an offender's register'-ey. 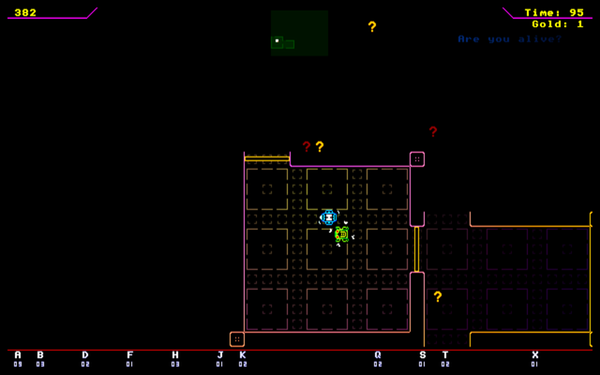 - locked doors & special chests, and linking it to the console: there's actually going to be a fairly weird and creepy text adventure unlocking aspects of the game, based on Duncan Bower's disappearance, finding passwords and decoding the glitches in the walls. Big-picture-wie, ideally, I want to build a little community around Spellrazor: people giving me suggestions, swapping seeds, videos, screencapping best times to bottom of the dungeon, etc. Indie dev is pretty lonely, so feeling there are other people out there who love this game as much as I do is a big deal. ...that's only if I can convince my wife it's not a collossal waste of everyone's time and money. If not... I guess I move onto the next thing and try a different take on BeMuse, perhaps. Here's a fun thing to do with friends: play with 2 people. Turn off slowmo. One person controls movement, and the other controls spells. It's a hoot. And you lose friends. But first the hoot. And thanks for showing an interest. I really appreciate it. This looks crazy, but good! So, do the 27 fire buttons correspond to 27 different spells/weapons? Thanks! It is a bit mad, but it's not surprising. Yes - letters are spells - 27 of them! You have access to all spells at the mere touch of a fire button, and you pick up letters as ammo for those spells via smashing chests, killing enemies and opening secret rooms (not in yet). There's no aiming (you fire at the auto-targeted enemy) so the skill is all in positioning and choice of spell. To make it easier and less panicky, the game auto-slows time as when you let go of the keyboard and stop moving. Can you imagine the '80s arcade machine, and what it would have looked like with 27 fire buttons!? Bonkers. New version 0.2.7 is now up. Lots of changes to the console, spells and enemies. The auto-slowmo thing now kicks in based on enemy proximity in Pacman CE-DX style. I think it works, but I'd be interesting in hearing other opinions than my own! - Vaults are now in, and the only way to get extreme spells like 'Rocket'.